PUTRAJAYA, 7 NOVEMBER 2018 – Tourism Malaysia had participated in the World Travel Market 2018 in London, from 5 to 7 November 2018, led by the Honorable Y.B. Datuk Mohamaddin bin Ketapi, Minister of Tourism, Arts & Culture Malaysia. This was the first time Datuk Mohamaddin led such a mission to Europe since taking oath. Among other delegates included Datuk Ahmad Shah Hussein Tambakau, Tourism MalaysiaChairmanand also Mr. Zulkafli Yahya, the Director for International Promotion (Americas / Europe / Oceania). This year’s strong delegation comprised of 18 tour operators, 14 hotels and resorts, 5 associations including product owner and airlines. There were also 8 representatives from local state governments. The Minister had paid a courtesy visit to H.E Mr. Mohd Suhaimi Jaafar, the Charge d’ Affaires for High Commission of Malaysia on 4 November. A busy schedule awaited him on 5 November, starting with the Grand Opening of the Malaysia Pavilion and launching of the London Taxi Wrap campaign. He also witnessed the MOU signing ceremonies with Malaysia Airlines, Tourism Selangor and Kowamas Holidays; and Sarawak Tourism Board and MAS UK/EU. He had also launched the Visit Melaka Campaign 2019 and Sabah’s East Coast Package. During this visit, the Minister met with various travel trade media including TTG, Travel Bulletin, Sky News, CNN, Selling Travel, Eurosport, BBC, and WTM Interview Wall. The Minister also had meetings with key European tour operators TUI UK and Kuoni, as well as British Airways. A PATA Dinner wrapped up the activities on this day. On 6 November, the Minister opened the Trade Seminar in South Gallery, attended the 2018 Minister’s Summit, and held an official press conference to update the international media on the latest tourism developments in Malaysia. WTM 2018, one of the biggest tourism trade fairs in the world, marks Tourism Malaysia’s 35th year of participation. Situated in Excel Exhibition Centre in Dockland London, the Malaysia Pavilion at stand no. AS700 took about 441 square meters in size, and featured a colorful motif of Malaysian tourism destinations and cultural attractions. Last year arrivals from UK reached 358,818 tourists, placing the UK as 10th highest arrivals to Malaysia in 2017. 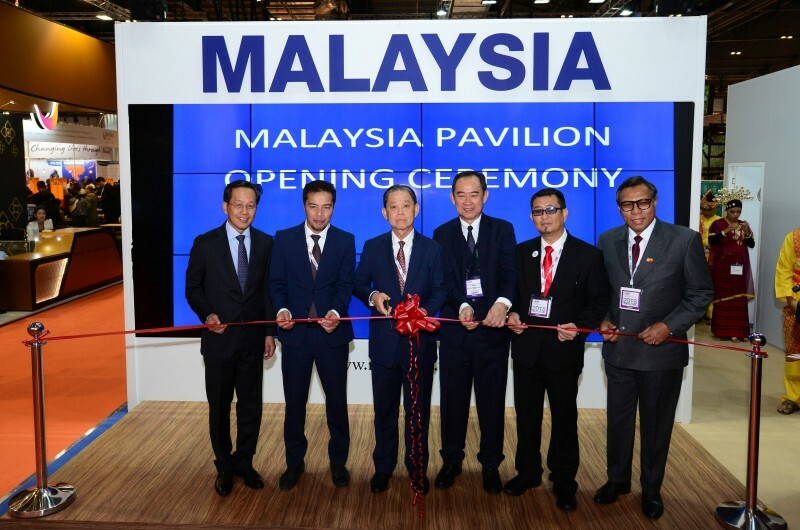 Minister of Tourism, Arts and Culture (third from left) officiates the opening of the Malaysia Pavilion at the World Travel Market, witnessed by the Chairman of Tourism Malaysia (third from right) and other guests.